Everything Elsea: Walking in a "Winter Wonderland"
If any of you are familiar with Central Ohio, and all of my blog readers should be, you know that the area is not prone to Winter Wonderland-ness. Let me take that back. Part of Central Ohio is prone to Winter Wonderland-ness. That part is anything that is north of the I-70 median and west of the I-71 median. We live exactly 15.6 miles south of I-70 and 39.6 miles east of the I-71 median which puts us smack dabin the Winter Wonderland-less Central Ohio. I honestly lose sleep over this because: I. Love. Snow. This brings us to my problem, I'm thinking I may have jinxed any chance of having a decent snowy year by choosing this blog background. Granted I'm not going to change the background because it was the best one I could find that will still be appropriate (and I use that word lightly given my first paragraph) after Christmas. Plus I'm hoping everyone will pitch in and say a little prayer to the Big Man Upstairs asking for some snow this year. I did some a single act of research today and found that according to the Farmer's Almanac we're in for regular winter, while the rest of the country is in for a frigid, snowy winter. 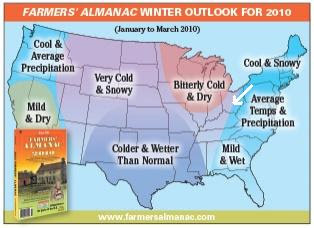 Please take a look at the lovely diagram compliments of the Farmer's Almanac. I realize its not too large, but please note the arrow which precisely pinpoints our location. It appears Central Ohio could fall in the "Very Cold & Snowy" category or the "Average Temps & Precipitation" category. Based on previous years' experience and my luck of not getting a BIG snow storm hardly ever, I'm going to guess we're in the "Average Temps and & Precipitation" category. I'm thinking the purple/blue division line follows I-71 which, again, we are precisely 39.3 miles (as the crow flies) to the east of. As of today our first chance of snow is Monday. This is our third or fourth chance of a first snow so I wouldn't be surprised if it doesn't happen. I'm pretty sure had things not worked out for me in the Business Management school at Concordia I would have gone on the be a meteorologist. Or I would at the very least have gone to COSI to play with their little weather channel green screen. I apologize if this post was boring, but I thought I'd post something that is non-Christmas related yet near and dear to my heart. And if you are in the portion of the country that is expected to get lots of snow and cold temps, I am sincerely happy for you and beg for you to send it my way when you're done with it.